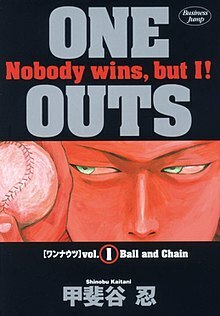 One Outs (Japanese: ワンナウツ, Hepburn: Wannautsu) is a Japanese baseball manga series by Shinobu Kaitani originally serialized in the seinen manga magazine Business Jump from 1998 to 2006 and from 2008 to 2009. An anime adaptation by Madhouse aired from October 7, 2008 to March 31, 2009. The Saitama Lycaons are the weakest team in the Japanese league. Hiromichi Kojima, the Lycaons' star batter, forms a training camp in Okinawa to try for his last attempt at a championship after 21 years. When the minor league pitcher training with Kojima becomes injured, him and Kojima's trainer goes to look for a replacement, but run into trouble by participating in the "One Outs" game, where a pitcher and batter duel 1-on-1 with money on the line. The next day, Kojima arrives to avenge his teammates and meets Tōa Tokuchi, who appears to have no special pitching skills, but defeats Kojima easily and causes him to enter seclusion to re-evaluate himself as a professional player. Later, Tokuchi accepts a rematch after Kojima raised the stakes, proclaiming he will retire immediately if he loses, but he will "take" Tokuchi's right arm to make sure he will never gamble on baseball again if Tokuchi loses. This time, Tokuchi experiences his very first loss and offers Kojima his right arm to have it broken. Instead, Kojima tells him he never intended to break it, and asks Tokuchi to join the Lycaons and use his unique pitching ability to take the Lycaons to the championship. Soon, Tokuchi meets Saikawa, the greedy owner of the Lycaons who only cares about the team making a profit. Saikawa is reluctant to give Tokuchi any sort of significant salary due to his inexperience as a professional, but Tokuchi offers an unusual proposal. He proposes the 'One Outs contract', a performance-based pay where he gets 5,000,000 yen for every out he pitches, but loses ¥50,000,000 for every run he gives up. Later on in the baseball season, it is revealed that even the "One Outs contract" was done for the benefit of the team as Saikawa had no plans to keep the Lycaons and set up a deal to sell the team to the Tronpos company. Knowing this, Tokuchi formed an alliance with Tronpos and provided financial intel on Saikawa in exchange for financial backing. With this intel, Tronpos is able to make sure they are able to purchase the Lycaons as cheaply as possible by spreading rumors to dissuade other corporations from bidding. Unfortunately for the Lycaons, Tronpos also has no plans on proceeding with the current lineup and will replace all players after purchasing them. The Tronpos chairman made a mistake by believing Tokuchi to be his supporter and told Tokuchi his intended bid, to which Tokuchi responded with a last minute counter-offer. For triple the bid, Tokuchi becomes the new owner of the Lycaons. Though there is heavy dissent in the team due to his dubious nature, Tokuchi starts to implement a wide variety of changes, most notably the L-Ticket. It is the old admission ticket with a new 1.5× admission fee, but with the promise of a full refund if the Lycaons loses the game. Additionally, the spectators can make up to five votes for the MVP on the ticket, which will directly influence the new player salaries by paying 200 yen per vote. Though the Lycaons are in chaos with the new changes, the team slowly realizes that these changes are what the team needs in order to become strong enough to win the championship. A successful gambler and pitcher in the game called "One Outs". After losing a game of One Outs for the first time ever to Kojima, he joins the Lycaons with an odd contract, the One Outs contract, that decides his pay based on his performance. He uses his perceptive intellect to manipulate professional baseball, and becomes a professional baseball team pitcher. In that role he psychologically manipulates and intimidates the batters he faces along with playing high-stakes psychological and intellectual battles against his own antagonistic team owner, competing team coaches, and underhanded opposing teams. Kojima is the cleanup batter for the professional baseball team, Saikyou Saitama Lycaons. He is defeated by Toa during his time at the training camp after challenging Toa to avenge his relief pitcher, Nakane. After his defeat, he goes into the forest to train himself mentally against Toa but as he trained he injured his wrist. Even with the injury, he decides to challenges Toa to a rematch with the bet that if he wins, he would take Toa's arm. With the One Outs game ending in a do or die pitch, Kojima resolves that he couldn't lose, getting in the way of the ball and making the pitch count as a deadball. He wins the match because of this, albeit not without contention. Toa admits defeat and Kojima makes Toa join the Lycaons, effectively taking Toa's arm and disabling him from gambling ever again in a One Outs game. He is the catcher of the Saikyou Saitama Lycaons and is the first to notice Tokuchi's talents as he catches Tokuchi's simple-looking fastball pitches. Apart from Kojima, Ideguchi is the other key member of the Lycaons and stands as the voice of reason in disputes. Due to Ideguchi's trust in Tokuchi, Tokuchi also trusts Ideguchi enough to include him in his plans. Together, they dismantle the opposing team's offense and tricks. The owner of the Saikyou Saitama Lycaons team. He is more interested in gaining money than getting the Lycaons to win. He forms the One Outs contract with Toa Tokuchi in order to avoid paying a salary to Tokuchi, and to increase the Lycaons sale value by increasing their profitability. The manager of the Saikyou Saitama Lycaons; Obediently obeys every order given to him by the owner until anime episode 15. In episode 15 he is likened to a dog for his unwavering obedience to the owner. Mihara genuinely wishes for the team to succeed and begins to oppose the owner when the Lycaons start to win their games thanks to Tokuchi. The Fingers' starting pitcher and the Rookie of Year for the year before. He also notices how terrifying Toa is when he pitches, he urges the team to try and take a hit, but the result is still the same and his team loses the match. He is named by Takami of the Mariners to be the strongest pitcher in the league. A foreigner who was scouted by Coach Shiroka of the Bugaboos during a 100m track and field event. Though he fell behind in the race, he was able to lead up to the 30m mark. Coach Shiroka explained that since the distance between bases was about 27m, Johnson is the baseball world's fastest man. Johnson is also known for his ability to bunt, and sports an intimidating tattoo around his right eye. The strongest team in Japan for the last 3 years. This team goes against the Lycaons with 3 consecutive games, with their strongest cleanup crew comprising Takami Itsuki, Thomas and Brooklyn. One of the cleanup batters in the team "Chiba Mariners", he is known to be a prodigy in baseball and his eyes have the best in motion vision in the baseball world. He is the best hitter in the entire league. Kojima is in his last year in the major league and has never won a championship. He and a few teammates go on a training camp to practice. Their only pitcher injures his finger and can no longer pitch to Kojima. The remaining teammates feel bad and begin to search for a new pitcher quickly. Who they find and where they find this new pitcher is not where they had expected. The One Outs battle between Kojima and Toa Tokuchi does not end according to Kojima's wishes, leading him to seek enlightenment to beat Toa in the mountains. Kojima returns and rechallenges Toa Tokuchi, betting his pro career against Toa's arm. Kojima lets himself get hit in order not to lose. He gets Tokuchi to join the Lycaons. Tokuchi negotiates an astounding contract that looks very much to be in his disadvantage with the Owner of the Lycaons. The Owner is shocked when he receives the amount he is to pay Tokuchi after the pre-season game, which is the first game Tokuchi plays in. In the second game, which is against the Fingers, Tokuchi retires all the batters. The Lycaons play against the Eagles. There is a bribed player within their midst. Tokuchi tells the player to stop playing. The Lycaons are now at a disadvantage, but fight to get the points. Tokuchi allows the player to return at the end of the episode. The player, Yoshida, plays excellently. Tokuchi becomes tired and pitches a dead ball. Yoshida takes over him. The Lycaons win the game. Four more conditions are added to Tokuchi's contract. The next game they play is against a very strong team, the Mariners. He pitches first and walks the first two batters, an unexpected action. Two out of the Mariners' three strong batters are retired by Tokuchi. Takami notices an oddity about Tokuchi's fastballs and explains to his team why it's different. With what Takami has advised them to do, they start to hit the fastballs, but they have yet to score. Tokuchi does something unexpected and Takami is struck out at the third pitch. Takami realises Tokuchi's weakness-his stamina. Tokuchi is forced to push himself. The game goes past the 9th inning. Kojima decides to bat. Tokuchi tells Kojima something. Kojima manages to hit the pitch. The Lycaons win the game. The next game against the Mariners, the Mariners' batters are able to hit Tokuchi's pitches. Takami suspects that Tokuchi has a plan, and at the end of the episode, manages to figure it out. Tokuchi plays for time while the Mariners rush to reach the fifth inning. When it's the Mariners's turn to defend, Tokuchi tells his team to tie with the Mariners. They manage to do so. The 4th inning ends with the Lycaons in the lead by one point. The Mariners underestimate Tokuchi, thinking he'll have trouble pitching in the rain. Instead, he turns it to his advantage. The game ends in an unexpected way. The Lycaons are up against the Bugaboos. The Bugaboos have a new team manager, one who is known as Shirooka the Strategist. In the midst of the game, Tokuchi is placed in an unexpected position in defense. Then, Manager Shirooka sends out a new player, Johnson, who is a very fast runner. Johnson successfully steals home while Tokuchi is the pitcher, and Tokuchi has given up his first run as a professional. Tokuchi talks to the team about the way to stop Johnson. Tokuchi bats near the end of the episode. Tokuchi discovers the weakness in Johnson's defense. Tokuchi's plan to stop Johnson is set into motion. However, Tokuchi has another plan in addition. The plan works. Later, when the Bugaboos are attacking at the ninth inning, Johnson taunts Tokuchi and Tokuchi decides to battle it out with Johnson. Tokuchi wins the battle and the Lycaons win the game. The episode ends with Tokuchi saying that the real battle will be tomorrow. Johnson is the leadoff batter for the third game. Tokuchi is sent to pitch while Johnson is at third base. Tokuchi intimidates the batter. Shirooka decides to change the strategy. Tokuchi is making errors at his position at first base. Another strategy to stop Johnson is carried out. However, Shirooka carries out a plan to counter it. Tokuchi shifts the outfielders defending positions. Tokuchi intimidates the batters. Shirooka realises that Tokuchi is really a terrifying person. The episode ends with the game going into extra innings. Game 3 in a 3 game series between the Lycaons and the Bugaboos has entered extra innings with the score tied 0-0. Tokuchi uses the manager Mihara Yuuzaburou's desire to win this game to break the owner's hold over the manager. With the manager no longer obeying every order that is given to him by the owner, Tokuchi is free to pitch the remainder of the game against the order of the owner. Tokuchi uses the rest of the game to break down every aspect of Johnson's game showing that nothing about him is to be feared, not his batting ability or his speed. The Lycaons go on to win the game 1-0 thus winning the series against the Bugaboos, 2-1. Tokuchi explains why he was so sure his plan would work. Tokuchi tells Kojima there is a simpler way to defeat Johnson, and the method is shown when Kojima watches the game where the Bugaboos go against Blue Mars, the Lycaons next opponent. The owner of the Lycaons talk with a mysterious person. Tokuchi attends the briefing on the BlueMars. Tokuchi stays back and watches the video, and says to Kojima that the Blue Mars are cheaters. In the game, though the Lycaons were leading, the Blue Mars caught up. The Lycaons are shocked and become discouraged when the Blue Mars tie them. The manager Mihara tries to lift their spirits. The Lycaons end up losing to the Blue Mars in the first game. Tokuchi states that he can pitch the deceiving knuckleballs, and then shows the team why the pitches are fake knuckleballs. The team becomes angry when they know that the BlueMars were cheating. Tokuchi tells Ideguchi that their signs are being stolen. Tokuchi, Kojima and Ideguchi search for the signal that tell the BlueMars the Lycaons's signs. Tokuchi decides to use the Blue Mars sign stealing against them. Tokuchi, Ideguchi and Kojima continue to search for the way the Blue Mars are stealing the Lycaons's signs. Tokuchi discovers the trick behind their shady signal. Tokuchi goes off to turn their sign stealing against them. Since the manager is unwilling to listen to Tokuchi, Tokuchi finds a way to convince manager Mihara. The manager listens to Tokuchi. Tokuchi does something without the manager's knowledge that enables them to get a point. The Lycaons manage to take the lead. The Owner has a plan to get Tokuchi's earnings to disappear. Tokuchi suggests changing signs. In the second game, yet the Blue Mars are still able to hit the pitches. Ideguchi realises that their signs are being stolen. At the end of the episode, Tokuchi states that they are being wiretapped. Tokuchi states that they have been wiretapped. He realises where the wiretap is. The assistant manager for the BlueMars is revealed. The Lycaons manage to lessen the point difference. Tokuchi's plan is accidentally revealed. Williams is sent to pitch in the final inning. Tokuchi has a plan to counter the fake knuckleball and goes to bat. At the end of the episode, he manages to steal up to second base. The Blue Mars catcher realises that Tokuchi knows about the fake knuckleballs. The Lycaons take the lead. The owner's plan to clear the amount Tokuchi has earned is explained. It is then set into motion when Tokuchi goes to bat. Tokuchi retaliates in an unexpected way. The episode ends with Tokuchi lying on the ground. Tokuchi is uninjured. He goes back to the mound to pitch. The Blue Mars try to frame him. The batter that accused Tokuchi finds the tables turned, and in order to avoid the Blue Mars being found of cheating, Tokuchi tells him to kneel down as an apology. The Lycaons go on to win the game and are no longer last place. But this is just the beginning. The aim is the championship. ^ Titsoff, Ader (January 22, 2018). "10 High Stakes Gambling Anime & Manga Japanese Fans Love". GoBoiano. Retrieved July 24, 2018. ^ One Outs anime television series announced at AnimeNation Archived 2008-12-11 at the Wayback Machine. This page was last edited on 10 April 2019, at 08:03 (UTC).